Smaller connector designs pushed by the cellphone world find a new home in portable and scaled-down gaming devices. For decades, young people have had their first exposure to connectors through gaming equipment. Although the vast array of electronics contained in these systems are hidden within the consoles and peripherals, perhaps no other product calls upon the consumer to engage so readily with visible connector technology. The fact that even a child can intuitively set up a gaming system that features a diverse collection of interconnects is a testament to successful design. One of the hottest holiday gifts in 2016 was the NES Classic, a small-scale replica of the original 1985 Nintendo NES console. That groundbreaking device brought graphics-intensive (well, compared to Pong) videogames into the home and helped launch a generation of gamers and technology enthusiasts. This replica is a basic console that connects to a television and features two outward-facing ports for game controllers. Simple HDMI and micro USB ports get the job done. The original console featured two connector ports right on the front, and was significantly larger than the new version because it also had to accommodate the game cartridges, which clicked into place with a proprietary 72-pin connector. This part endured a significant number of mating cycles — so many that a continuing aftermarket exists for classic game enthusiasts who need to replace this connector when it wears out after decades of play. The new version, which is barely larger than those early game cartridges, holds preloaded games right on the motherboard, so that big 72-pin connector is no longer needed. Instead, the internal system contains an assortment of mini connectors adopted from the cellphone world. On the outside, HDMI and micro USB cables and ports link up the system. How nostalgic are those original old connectors? Well, this year’s hot gift promises to be the Super NES, a replica of the first next-generation Nintendo game console. While last year’s unit featured a fake game cartridge slot, this year’s unit features fake controller connector ports on the front. The real connector ports are hidden behind a panel. In the past three decades, the connector content of gaming equipment has not so much evolved as scaled down to meet the needs of portability. Long before everyone had a smartphone, gamers valued mobility, and Sega’s Game Gear, Nintendo’s Game Boy, and the Nintendo DS handheld units let people play on the go. Last year, Nintendo released the Switch, the most significant recent innovation in portable gaming devices. Most of the internal connectors, latching ribbon cables for the speakers and fan (these graphics-intensive units create a lot of heat), micro RF coax, headphone jack, — as well as a USB Type-C connector at the charging port, are familiar form factors that are widely employed in the cellphone world. An internal micro SD card is connected via micro push-in pull-out connectors. This system also features “Joy-Con” controllers, which can be docked to the main body and screen of the unit, or disconnected via a set of 10-pin connectors. When the controllers are separated, Bluetooth handles communications between them and the main unit. Nearly all of the interconnect products used in Sega and Nintendo gaming products are off-the shelf components, which is a big plus to those gamers who are inspired to become tinkerers, and repair and enhance their toys. That kind of inspiration is undoubtedly fertile ground for creating the future innovators of the connector world. USB, micro-USB, and mini FFC/FPC connectors and cables are some of the preferred parts for this market, and several top connector companies supply the long-lifetime, high-mating-cycle versions of these products that gaming systems tend to demand. 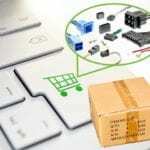 TE makes a range of miniaturized connectors and antennas that were adapted from other applications but play well with gaming components. They are inside popular products like the Nintendo Switch, Sony PlayStation, and Microsoft Xbox. The new player, Oculus, which offers virtual reality headsets, also feature TE products. TE’s miniature connectors are inside many of the latest video gaming products. Molex makes SATAs as well as the ribbon cables favored in many small-scale devices. Hirose makes micro-USB connectors that are designed for intensive use in small devices. I-PEX makes the mini FFC/FPC connectors, as well as the micro coax RF connectors. Additionally, the USB Type-C connector that is the new go-to for cellphone charging is being employed in new small-scale gaming equipment as well. Suppliers of this tech include Hirose, Molex, TE, JAE, Mill-Max, and Amphenol. Whether these components are in broad use or specially designed for gaming applications, they share some requirements with the phone world, namely low cost, small envelope spacing, and small size. They also have a unique requirement: They must be available in high volumes on a seasonal basis to meet order increases in advance of the holidays. ept’s Colibri connectors are used on many of the latest gaming machines motherboards.